This group fuses the raw energy of a New Orleans-style brass band with the sophistication of a contemporary big band. The album is funky. It's low-down. It moves, it grooves, and swings like a mutha! 8. Thank You, Sir, May I Have Another? 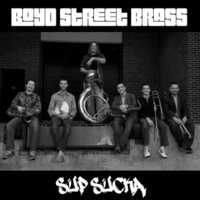 The debut CD of Boyd Street Brass, “Sup Sucka,” exemplifies the unique quality of the band; a quality that separates the group from other brass bands in the U.S. The CD consists of fourteen original works each having its own character. The variety of styles alone makes this album enjoyable, whether it’s the straight ahead swing of “Fire,” the funk groove of “Crusty White,” or the Zydeco beat of the CD title track, “Sup Sucka Akcus Pus.” This, combined with the music’s range of tempi, colors, and dynamics, as well as periods of interesting structural design, keeps these tunes consistently fresh for the listener. The kind of diversity found in this music is also key to highlighting the distinct sounds of the individual members of the band. All seven players are featured at different times throughout the CD and featured in multiple ways. This is most easily recognized with the inclusion of four vocal charts. With each track the listener finds new surprises. Every tune is packed with quirks and unexpected turns but at the same time maintains an element of familiarity. Every tune is full of power and energy and yet possesses an inner beauty. These tunes, all together, performed by these seven musicians create a thrilling listening experience. “Sup Sucka” will certainly be a welcome addition to any music collection.